The Evan B. Donaldson Adoption Institute has released a report that finds there is no child-centred reason to prevent gays and lesbians from becoming adoptive parents. It recommends that they be utilised more extensively to provide permanent, loving homes for children living in state care across the country. The Institute report, which is part of a larger, more extensive yearlong project that will be completed and released in several months, is intended to provide a research-based context for the ongoing debate in the United States over the adoption of children by gays and lesbians. Most importantly, the Institute seeks to develop information to help shape best practices that focus on providing boys and girls in the child welfare system with safe, committed and enduring families. The principal findings of the report, which is entitled “Expanding Resources for Children,” finds children reared by gay and lesbian parents fare comparably to those of children raised by heterosexuals on a range of measures of social and psychological adjustment. 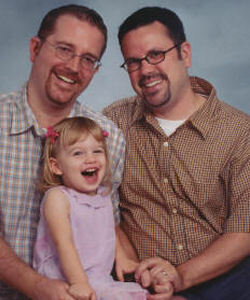 The study also shows the children of gays and lesbians adjust positively and their families function well. The limited research on gay/lesbian adoption points in the same direction. Though few states have laws or policies explicitly barring homosexuals from adopting, some individual agencies and workers outside those states discriminate against gay and lesbian applicants based on their own biases or on mistaken beliefs that such prohibitions exist, according to the research. The researchers also found laws and policies that preclude adoption by gay or lesbian parents disadvantage the tens of thousands of children mired in the foster care system who need permanent, loving homes. The Institute’s research examined the relevant issues, laws and practices relating to gay and lesbian adoption and parenting, and the available studies spanning the last several decades. It represents one of the broadest and most thorough reviews and analyses to date on the questions involved. The report recommends that child advocates and policy-makers take steps including moves to end legal and de facto restrictions on adoption by gays and lesbians. This includes working to expand co-parent and second parent adoption, as well as revising agency policies and practices that may impede their consideration as an adoptive resource. It also calls for the development of clear statements in support of such adoptions, recognising a “don’t ask, don’t tell” approach disadvantages parents and, ultimately, their children, and developing contacts with the gay and lesbian community in order to engage in genuine, informed outreach. The research proscribes research to inform the development of resources, training, and support to improve post-adoption success and work to include and educate children in the process, recognizing that they may encounter prejudice if adopted by gay parents.